He would know. Lothrop earned a master’s degree in historic preservation, and his contracting company, Building Heritage, is in the business of restoring old barns. These days, most of the barns he saves end up being used for non-agricultural purposes. He’s showing me this one simply because he likes it; the Conants aren’t clients of his. “We’ve never actually worked for anyone who’s a dairy farmer,” he says. Most farms in Vermont, however, are dairy farms. The 930-acre Conant farm is pretty big by Vermont standards, with 400 Holsteins producing milk for the well-known Cabot co-operative creamery. But among the 800-plus dairy farms in the state, about 80 percent have fewer than 200 cows. That’s tiny when compared to large industrial dairy farms out West, where several-thousand-head herds are the norm. For a Vermont-size dairy farmer—with milk prices fluctuating as they do—putting money into an obsolete barn can be impractical. Conant says he and his family have looked into state grant funding to help with repairs. 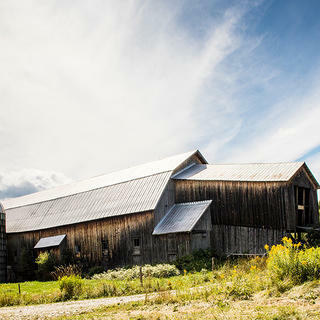 So important are barns to Vermont’s landscape that the state established a Barn Preservation Grant in 1992. The program has dispensed more than $3 million toward the preservation of 300-plus historic barns. Still, there are likely thousands more in need of repair. Conant, his wife, Alison, and their daughter, CC, with a few of their Holstein cows. For more than two decades, Vermont seems to have been in danger of falling from an idyllic Eden. The entire state has twice appeared on the National Trust for Historic Preservation’s list of America's 11 Most Endangered Historic Places, due to threats that big-box retail development would ruin its bucolic landscape and picture-perfect small towns. When I was a college student at the University of Vermont in the early 1990s, it was the only state that did not have a Walmart, and there was a lot of protest when one finally was built. For at least as long, the decline of Vermont’s small dairy farms has become a familiar story. “So why do you keep the old barn up?” I ask. The 1950s barn at Jasper Hill Farm in Greensboro, in Vermont’s Northeast Kingdom, is painted with a hippie-style celestial mural that includes a moon made of blue cheese. It’s the first clue that Jasper Hill is not a typical dairy farm. Given its award-winning artisan cheeses such as Bayley Hazen Blue and Harbison, the farm is held in awe by cheese lovers all over the country. As we look at the barn, which houses 45 Ayrshire cows, Browne tells me, “There’s a milk crisis, a surplus of milk. For a 50-cow dairy to be competing with farms out West with 1,000 cows is not feasible. The answer is cheese. Cheese gives farms a better economic viability.” Quite simply, farmers can earn more money making artisan cheese than by selling milk alone—as long as they let the cows graze freely and use non-GMO feed, both qualities that big-city foodies like. “Cheese is our vehicle for preservation,” Browne says. Indeed, along with barn preservation grants and farmland conservation, promoting Vermont’s artisan, high-end dairy industry has become a major part of the state’s multifaceted approach to keeping its farms and landscape intact. As my tour at Jasper Hill moves from farmyard to creamery, we enter a completely different environment. Gone is the mud and poop, and now there is an intense focus on sterility. In a white room, we scrub down; put on white lab coats, hair covers, and high rubber boots; and then wash the boots with a cleansing liquid. When dealing in raw-milk cheese, there’s no leaving hygiene to chance. Inside, we watch an enormous batch of fermenting milk being stirred hypnotically. Talk turns to curds and whey and starter culture and rennet. Browne asks the cheesemaker if it’s time to make cheese, and he says we’ll need to wait until the pH is ready. “There’s still a whey to go,” he says, with a wink. In 2003, when Jasper Hill was still a fledgling producer, cheese giant Cabot approached it to collaborate on aging a special Cheddar. The result, Cabot Clothbound, has become a bestseller, and with several hundred thousand pounds sold each year, it represents nearly half of Jasper Hill’s annual sales volume. We walk into a vault in Jasper Hill’s aging cellars, and Browne says, “This is where we keep the stinky cheeses.” Four workers wash wheels of a rosy orange cow’s milk cheese called Willoughby, created by one of these smaller collaborators. “What’s up?” Browne says to the workers. 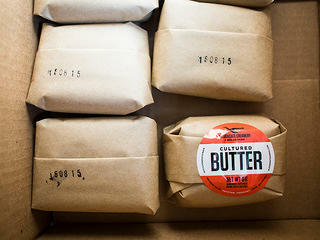 Bragg Farm's owner, Marisa Mauro, wraps her artisanal Ploughgate Creamery butter. In Burlington a few days later, I meet Willoughby’s creator, 32-year-old Marisa Mauro, who is selling small-batch cultured butter at the Saturday farmers’ market. Inside the city’s auditorium are at least a dozen vendors hawking local specialty dairy products—cheese, yogurt, ice cream, you name it. After the fire, Mauro found herself bartending to make ends meet. Then she heard that the historic 50-acre Bragg Farm, in Fayston, had become available. The picturesque farm, dating to the 1850s, has one of the most iconic views in Vermont, appearing in many photos with Sugarbush ski mountain in the background. Its barn was built by the Bragg family in 1909, and at its peak there were 45 milking cows and a thriving maple syrup business. But the family put the farm up for sale in 2010. That’s when the Vermont Land Trust stepped in. After a fundraising campaign that attracted 225 donors, it purchased the property through its Farmland Access Program, which solicited applications from farmers with ideas for how to use and conserve the land. “I had a month to write a business plan,” Mauro says. “I couldn’t think of a cheese to make, so I chose to do butter.” When the program selected Mauro’s plan in 2012, she paid only $165,000 for the farm, valued at $745,000, the following year—with a conservation easement that permanently protects it from development. By now, there are so many artisan cheesemakers in the state that the Vermont Cheese Trail boasts about 55 producers. “There are still plenty of people coming into cheesemaking, from many different backgrounds,” says Rachel Fritz Schaal, partner at Parish Hill Creamery in Westminster West and former president of the Vermont Cheese Council. “There are people who come here wanting a second career, but also seventh-generation dairy farmers trying to save the family farm.” Many artisan producers only make around 20,000 pounds of cheese per year, a drop in the bucket next to Jasper Hill or Cabot. Allison Hooper, cofounder of Vermont Creamery, started her cheesemaking career in the 1980s. She’d spent some time learning how to make goat cheese in France, and then drifted to Vermont. “My [thinking] was, why not raise goats on these hill farms that were obsolete and no longer had cows,” Hooper tells me. Hooper’s goal is even larger than preserving just one farm. She and cofounder Bob Reese hope the Ayers Brook model can be replicated all over Vermont. With several hundred milking goats, it’s being run as an “open book” demonstration goat dairy—meaning other farmers can study Ayers Brook and learn sustainable goat farming and breeding. The hope is to convert some farmers to producing goat milk, which fetches more stable prices than milk from cows. And with Vermont Creamery’s growth, these new goat farmers will have an immediate buyer. In other words, it’s one more part of the patchwork of solutions that will keep Vermont farms viable and out of developers’ hands. Marisa Mauro's packaged butter is sold in specialty stores throughout the Northeast. After visiting the Conants’ red barn, Eliot Lothrop and I check out a barn dating to 1800 that a family is restoring in Westford. It will become a party space and kids’ playroom, complete with a skateboard ramp. We explore another large red barn in Jericho, built in 1910, that is now used as a wedding and event space. They may not have been restored to their original uses, but they’re preserved nonetheless. My last stop with Lothrop is at the Edmunds Farmstead in Richmond, named for George F. Edmunds, who served in the U.S. Senate from 1866 to 1891. Lothrop used to rent the old milkhouse here when he was a grad student, and he wants to show me the abandoned monitor barn next door. It dates to 1901, and was made obsolete by a federal dairy act passed in the 1920s. This act required dairy barns to have washable (not wooden) floors, and it more strictly regulated where animals—and their manure—could be housed. The building is “not in great shape,” according to Lothrop, but it reminds him of why he started preserving barns in the first place.